The General Data Protection Regulation (GDPR) is the new legal framework of data protection across the EU. Starting 25th May 2018 it will be enforceable. 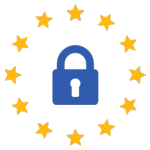 This post clarifies how CloudConvert complies with the GDPR and what our customers can do to be compliant. In the terms of the GDPR, CloudConvert takes two different roles: CloudConvert is classed as data controller, if it provides services to end customers and directly collects or processes personal data. CloudConvert is classed as processor, if it processes data on behalf of a data controller (typically a customer of CloudConvert). If you are an organisation and use CloudConvert to process your customers files, we are typically acting as processor. This is the case if you collect personal data and send them to us for conversion, for example via our API. Processing provided personal data solely in accordance with your instructions. CloudConvert will never process or share your data for any other purposes. Keeping your data inside the EU. Applying strict security standards to provide a high level of security. Implementing technical and organizational measures in accordance to Art. 32 GDPR. Solely using subcontractors that comply with the GDPR and have signed appropriate contractual agreements. Helping you meet your own regulatory obligations, by providing you with adequate documentation of our services. In accordance to Art. 28 GDPR it is possible to sign a data processing agreement with us. This binds us legally to the proper processing of data in accordance to the GDPR. Therefore, contact us. The CloudConvert website / HTML to PDF, JPG and PNG converter is often used to generate PDF files or thumbnails. Currently, we are using a proven, WebKit-based engine. However, there are use cases that require an even more modern rendering. We are currently experimenting with automating the Chrome browser for this matter. 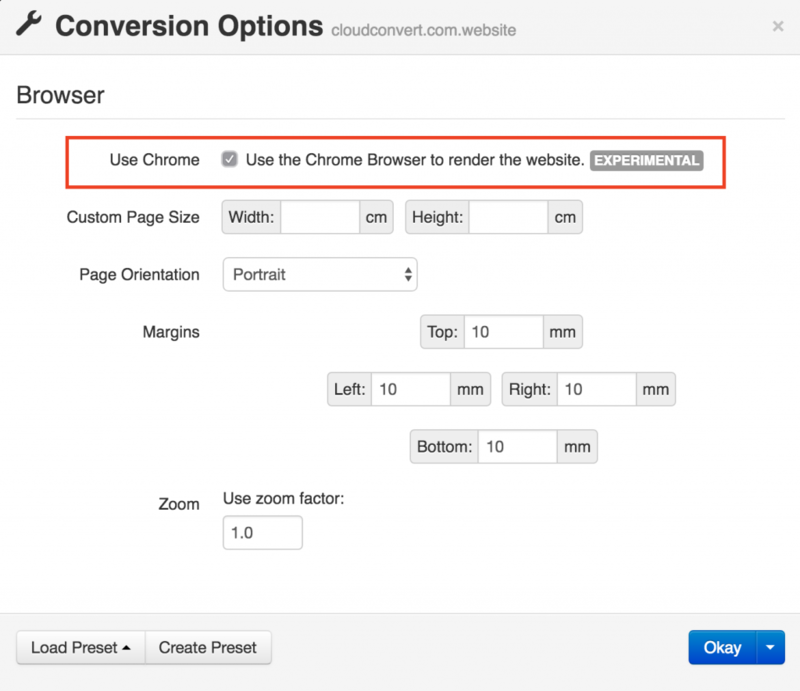 There is a new option available to enable Chrome for converting HTML files or websites. This option is named "use_chrome" when using our API. We are looking forward to get your feedback about this new feature. In particular we are interested if there are any formatting issues or if there are required options missing. AWS Lambda is an event-driven compute service which runs your code (Lambda functions) in response to events, such as changes to data in an Amazon S3 bucket. 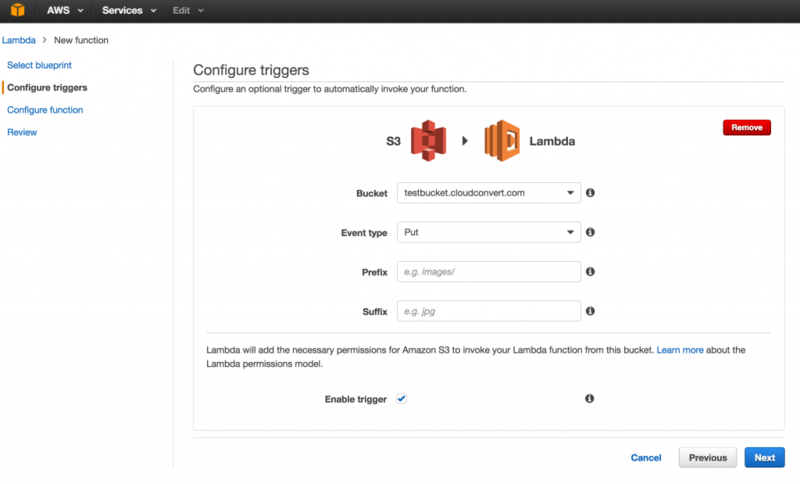 The CloudConvert API can be used to automatically convert all files, added to a specific S3 bucket. Typical use cases are converting all office documents to PDF, creating thumbnails or encoding videos. Set CLUDCONVERT_API_KEY to your personal API key. Set AWS_ACCESS_KEY_ID and AWS_SECRET_ACCESS_KEY for downloading and uploading from/to your S3 bucket. Adjust the conversion paramaters, such as outputformat according to your need. All possible options can be identified using the API Console. Create a ZIP file which contains convert.js and the node_modules folder. 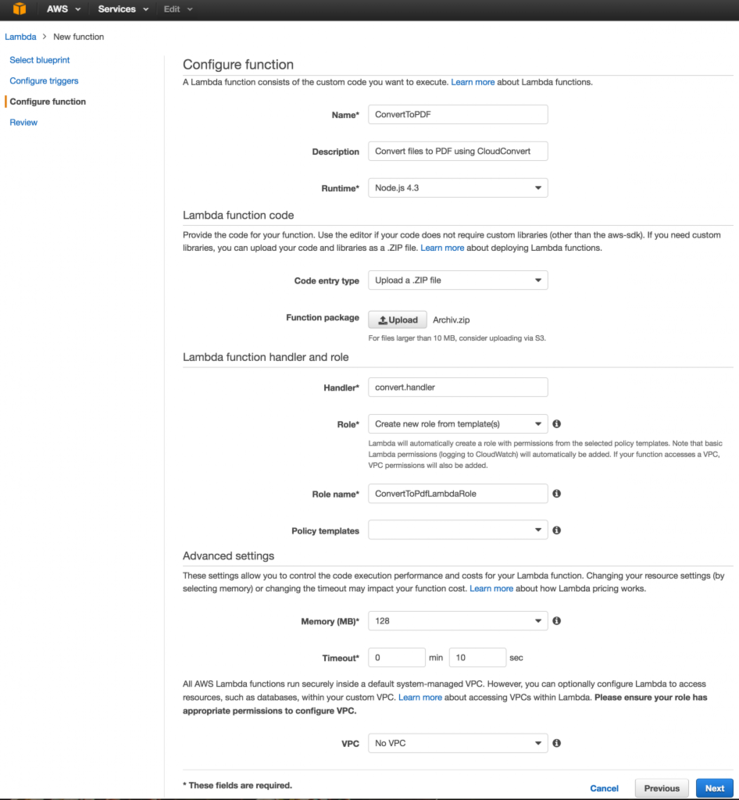 In the AWS Console create a new Lambda function. Select Blank Function blueprint. Select S3 trigger and your bucket. Set Event Type to PUT. Adjust Prefix and Suffix to trigger for specific files only. Choose a name for your Lambda function and use Node.js 4.3 as Runtime. Upload your previously created ZIP file as Lambda function. The Handler name needs to be convert.handler. The lambda function does not need any specific permissions: you can create a new empty role. A timeout value of 10 seconds should be sufficient. Please note that the lambda function only triggers the actual conversion and terminates as soon as the conversion was started. Therefore the timeout does not affect the time needed for the actual conversion. Done! You can test your Lambda function by adding a new file to your S3 bucket. Our Amazon S3 integration is a well used feature. Besides S3 we now have integrated OpenStack Storage (Swift), Microsoft Azure File Storage and Google Cloud Storage. You can use any of these file storage solutions as input and output for CloudConvert conversions. Our API Console has been updated and can be used to live-test the new storage options. We are happy to announce that CloudConvert is now fully integrated with Zapier! Using Zapier you can connect CloudConvert to 500+ other Apps like Evernote, Basecamp, Gmail, Trello, Slack and so many others. Below you can find some ideas for possible "Zaps". We are looking forward to see your workflows and use cases for Zapier! We did a lot of improvements on our API regarding input file uploads. Previously you had to embed the file together with all your parameters in a single multipart/form-related POST request. Although such multipart requests are widely used, implementing them is often pretty inconvenient. Therefore we decided to provide an alternative way of uploading the input files. In short you can use now a simple PUT requests to a designated upload url and send the actual file content as body of your request. Checkout our updated API documentation for details. Don't worry - as always, our API stays full backward compatible. If you are using the old method of uploading files, nothing needs to be changed. Our suggestion of using the new method only applies to new implementations.